Yank Sing 101 Spear Street, San Francisco, CA 94105 was a mind blowing experience for us. Good Chinese food with good service just doesn’t happen in New York. It’s something I’m not accustomed to, and for the first few minutes, it was awkward. They had my reservation and seated us promptly, handing me a black napkin. Did they really just bring us ice water right after we asked for it? Bizarre. 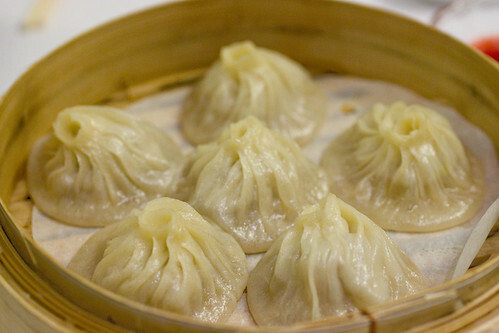 Would we like Ginger Pork Soup Dumplings? Of course! Wait, did you just ask me that in English? 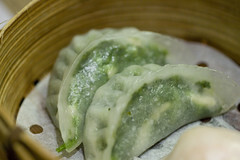 I was still in shock as I slurped up my first soup dumpling, with the most delicate skin possible. I can’t imagine how it can even hold crumbled meat (not one ball) and liquid, but it did and then it all just melted away on my tongue. 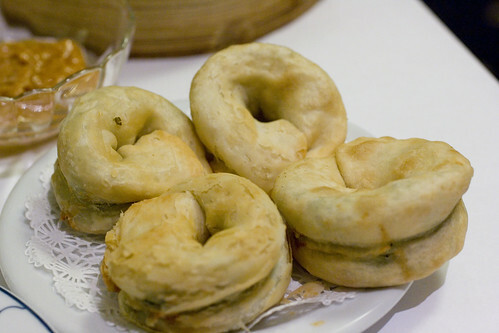 These Green Onion Pastries, that looked like double stacked doughnuts, caught my eye next. They were flaky but flavorless, already a bit cold. The peanut sauce didn’t help much and we left a pile of these to be taken away. The next server came by holding a tray of Walnut Shrimp, a classic banquet dish. 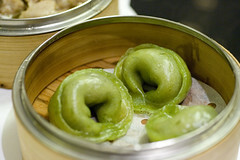 I was surprised but then saw many more non-dim sum style dishes floating around. Seeing our disinterest, she asked us what we were interested in, steamed or fried? We answered steamed. She muttered into her head set and strolled away. A cart with dumplings arrived at our table moments later. We hit the jackpot! 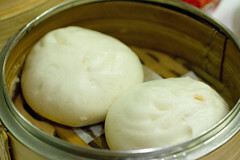 Dumplings and doughs are their specialty, so fresh and tender, often thinner than the usual. We had several different shapes with different fillings, loving the chopped vegetable and vermicelli, the lightness of snow pea leaf with touches of bamboo, the clean, well-seasoned spinach. Only the crystal shrimp was leaning towards rubber-y. We ate as we watched the efficient movements of staff and marveled at the wonder. 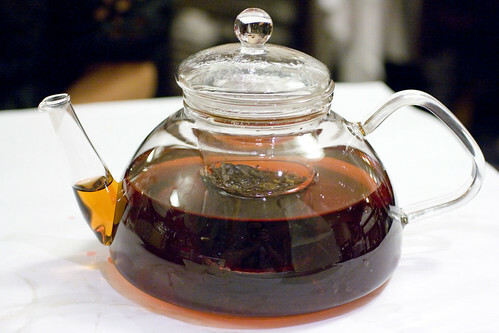 They even use clear tea pots so they can see when they should refill it before you ask. How clever. My tea pot was always full. 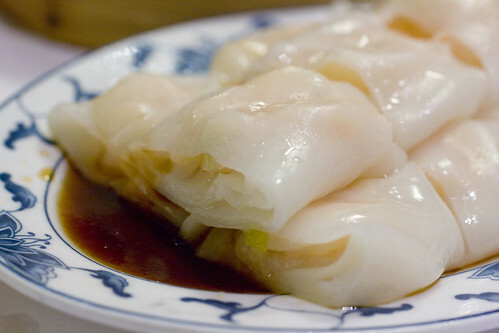 I don’t call it dim sum until I have Shrimp wrapped in Rice Noodles. These gentle sheets were so delicate, holding shrimp that really filled their sleeves. The sweetened soy seemed to be thinned with broth, which was suitable. 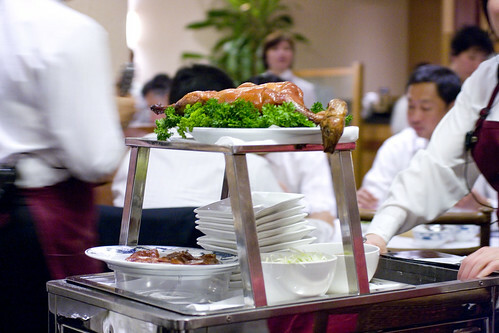 After the peking duck cart rolled by a few times, we gave way to temptation. I like that you can order per piece. 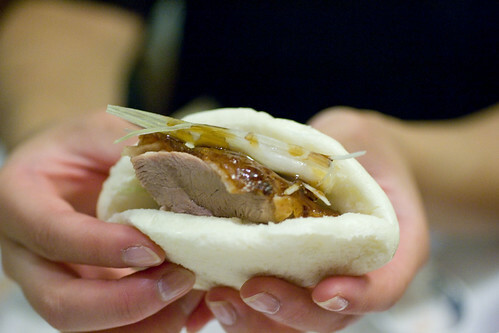 The fluffy bun, fresh scallion, and juicy duck were all great but I would have preferred more skin to meat ratio, because that’s really what you eat Peking duck for. 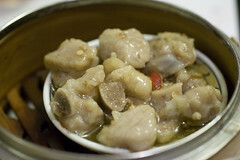 The little chunks of pork ribs were fatty but not as oily. Each one was packing bold pork-y flavor for a bite sized piece. 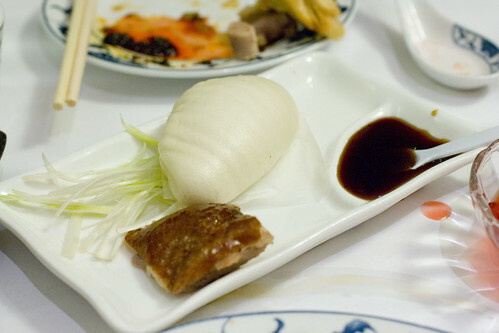 By now, we were stuffed so I ccouldn’t believe Lon wolfed down some roast pork buns at this point. They were deceptively fluffy light buns with the filling evenly spread across, so soft and easy to eat, but still. I nodded for the Fried Chive Pockets but it ended up being a waste, overly fried and oily. There wasn’t enough filling to taste any chive. I couldn’t leave without dessert, but I ate one and packed the rest. 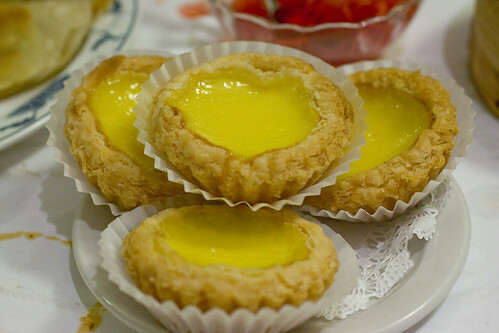 The egg tarts were not quite as egg-y as usual, which also made it seem less rich, but the smooth custard inside of flaky pastry is still irresistible. Wanting more, we ordered Curry Chicken Turnovers to-go, a snack for later. We had heard Yank Sing was expensive so we made some guesses as to how much the bill would be, but we were still surprised when it came out to $98.33 (before tip). Wowzers! That is expensive dim sum, but we were still happy with the meal. A few dishes were definite misses but I’d definitely go back because now I know which ones to get and the good ones, plus staff that actually cares about you, makes it worth it. Thanks for the recommendation Carolyn! posted by jessica	at 10:10 AM	Filed under Asian, Restaurants, Travel. You can follow any responses to this entry through the RSS 2.0 feed. Both comments and pings are currently closed. The shrimp in rice noodles look incredible! I just had breakfast, but I want some of those. I can’t pick just one thing, as everything looks pretty wonderful. I’m glad to hear that you enjoyed Yank Sing. I used to work in a building nearby and frequented their establishment for lunch. If you return, I think their fried dim sum is also pretty good, greasy but good. Fresh Local and Best, the next time I’m in SF, I’m definitely going back to Yank Sing! 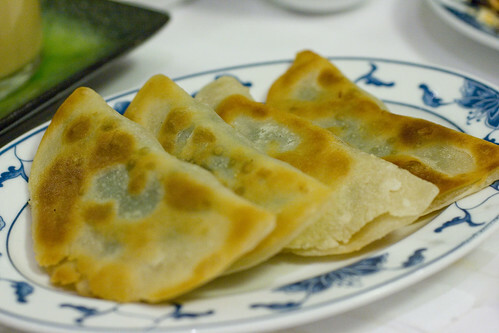 The idea of a green onion pastry sounds super good actually. Too bad it didn’t quite work. There’s hardly good Chinese in our part of LA, so a November trip to San Fran will really get us ready for great dim sum at least. Duo Dishes, this is some rockin’ dim sum! I wish I could go with you again in November. 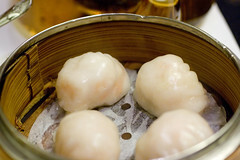 Oh, wow, everything especially dim sum looks so good here! Excellent place! Mmm, looks tasty. I’ve always wanted to try Yank Sing but just haven’t gotten around to it yet. Looks great! You’re very welcome about the recommendation. Yes, not cheap, but definitely high-quality dim sum. It’s where I had my wedding banquet. 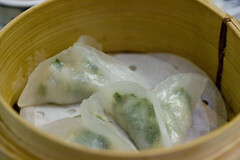 No dim sum at that event, but some utterly dreamy food that I still long for again and again.